We are all dependent on our phones and tablets for almost everything. Imagine you traveling someplace and your flight is delayed for hours. What better way than using the best coloring apps for adults for android or other OS to pass the time productively? We certainly cannot carry our adult coloring books and color pencils everywhere now, can we? This is where the best coloring apps for adults come in handy. So, today, we’re sharing with you one of our favorite anti-stress coloring book apps for adults, an awesome app called Coloring Book with Magic. What is Coloring Book with Magic all about? It is a neatly designed, intuitive and cool coloring book app created for all Android users that need stress relief and mind relaxation. Full of fantastic drawings and artwork developed by a talented digital illustration artist, this app will most certainly awake your inner child, your imagination and creativity. This magical stress coloring book can offer you some relaxation time to relieve all your stress and anxiety. With more than 5 categories and over 20 cool color palettes, it lets you choose whatever you like and color/recolor anytime you want, anywhere you are. It has white backgrounds, friendly user interface and simple coloring controls. The drawings are constantly updated and you’re able to print or share your creations with a simple tap. Just browse through the multiple drawings, tap to fill and color them with your own imagination. 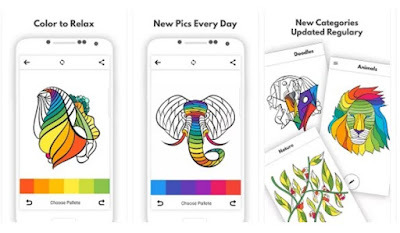 Get away from your everyday life and problems and awake your imagination by downloading Coloring Book with Magic from Google Play – it is totally free of charge!